Objective: The incidence of thyroid cancer, the most common endocrine malignancy, has increased dramatically in the last fifty years. This article will review the standard approach to thyroid cancer treatment as well as novel therapies under investigation. We will also address potential cost considerations in the management of thyroid cancer. Study Design: A comprehensive literature search was performed. Results: The high prevalence of thyroid cancer and the availability of novel therapies for patients with metastatic disease have potential economic implications that have not been well-studied. Because many patients likely have very low morbidity from their cancers, better tools to identify the lowest risk patients are needed in order to prevent overtreatment. Improved risk stratification should include recognizing patients who are unlikely to benefit from radioactive iodine therapy after initial surgery and identifying those with indolent and asymptomatic metastatic disease that are unlikely to benefit from novel therapies. In patients with advanced incurable disease, randomized-controlled studies to assess the efficacy of novel agents are needed to determine if the costs associated with new agents are warranted. Conclusions: Health care costs associated with the increased diagnosis of thyroid cancer remain unknown but are worthy of further research. Thyroid carcinoma can arise from either follicular or non-follicular thyroid cells. Follicular cancers include papillary thyroid cancer (PTC, 80%), follicular thyroid cancer (FTC, up to 11%), Hürthle cell cancer (HCC, 3%) and anaplastic thyroid cancer (ATC, 2%). PTC and FTC, which together account for the vast majority of cancers, are commonly referred to together as differentiated thyroid cancer (DTC). HCC, a subtype of FTC, is often classified on its own because it has a distinct histological appearance and is often less responsive to standard therapy. Similar to HCC, several subtypes of DTC, including tall cell, columnar and insular thyroid cancers, are thought to be more aggressive. In contrast to DTC, ATC represents undifferentiated thyroid cancer. Medullary thyroid cancer (MTC) arises from non-follicular thyroid cells called calcitonin-producing cells and accounts for about 4% of thyroid cancers. PTC accounts for the increase in new diagnoses of thyroid carcinoma. The reason for the increase in incident and prevalent cases is not clear, but many believe it is due to the widespread use of radiology tests done for other reasons that detect small nonpalpable thyroid cancers. Consistent with this theory is that the death rate from thyroid cancer has remained stable despite the increase in cases. However, a recent analysis suggests that all stages of thyroid cancer are increasing, a finding that cannot be explained by surveillance alone.3 Because PTC accounts for the increase in thyroid cancer burden, this review will focus on its management. Since PTC and FTC are often treated with similar therapy, we will collectively refer to this group of cancers as DTC. DTC is considered the least aggressive type of thyroid cancer and has, in general, an excellent prognosis. Overall, greater than 90% of patients with thyroid cancer are alive at 10 years after diagnosis. This reassuring number is attributed to the fact that most people with thyroid cancer have low-risk disease. However, a small percentage of patients with DTC exhibit more aggressive disease. Of the approximately 1,690 people who die yearly from thyroid cancer in the United States, about 70% percent carry the diagnosis of DTC.1, 4 The prognosis of patients with metastatic DTC is difficult to predict. Some patients with metastatic DTC have stable or slow-growing disease and maintain good quality of life without therapy. Others, however, develop progressive disease that is not amenable to traditional therapy and, as a result, suffer increased morbidity and mortality from their cancer. Five-year survival is lower in patients with distant disease (56%) compared with local (99.7%) or regional (96.9%) disease.1 Although it is difficult to predict who will go on to develop progressive disease, certain factors are implicated in increasing an individual's particular risk for developing progressive cancer. For example, age greater than 45 years of age, male gender, radioactive iodine resistance, and positive FDG uptake on PET scanning have been associated with poorer prognosis in DTC. Initial treatment for DTC includes surgery, radioactive iodine treatment and thyroid hormone suppression therapy. Standard of care recommendations are based largely on retrospective data. A prospective randomized trial to determine optimal therapy would be prohibitively long and expensive because survival rates are excellent. The lack of prospective data may lead to overtreatment of patients with low-risk disease who may have had no morbidity or mortality from their cancers if left untreated. Clinically unrecognized thyroid cancer has been seen in 4 - 35.6% of autopsies, which is far greater than prevalence of diagnosed cancer.5-8 Still, because up to 35% of patients, including those with low-risk tumors, have recurrences,9 most clinicians recommend therapy. Total thyroidectomy is the preferred surgery for DTC. Lobectomy is only considered appropriate for small, isolated tumors (less than 1 cm) without evidence of local spread. In retrospective studies, total thyroidectomy has been shown to improve disease-free survival and reduce recurrence rates.10-12 Total thyroidectomy allows for adequate staging and, when clinically appropriate, subsequent therapy with radioactive iodine (RAI, 131I). In addition, as many as 30-85% of patients have multifocal disease;13 this is not always appreciated until surgical specimens are evaluated. A small amount of thyroid tissue, called the thyroid remnant, is often left after total thyroidectomy. RAI can be administered postoperatively to destroy any remaining thyroid cells, normal or malignant. RAI improves the specificity of future surveillance imaging to detect recurrent disease. It also allows clinicians to monitor serum thyroglobulin, a protein made by thyroid follicular cells, as a marker of disease. Because thyroid stimulating hormone (TSH) stimulation increases iodine uptake in thyroid cells, patients are withdrawn from thyroid hormone therapy or treated with recombinant human TSH (rhTSH) in order to drive 131I into remaining cells. Most commonly, therapy with 131I is given as fixed doses, with small cancers confined to the thyroid receiving low doses (30 mCi) and more advanced cancers receiving higher doses (usually up to 200 mCi when lung metastases are present). Data suggest that high-risk patients (Stage III or IV) gain from RAI in terms of decreased disease progression and mortality.13-15 In contrast, the benefits of RAI in low-risk patients are uncertain and should be used selectively. Data suggest that RAI decreases recurrence rates in low-risk patients with tumors greater than 1.5 cm, but whether it improves cause-specific survival is unclear.12, 14-16 RAI treatment has not been shown to decrease recurrence rates or death in patients with isolated tumors less than 1.5 cm.12, 17, 18 Hay et al., reviewed PTC cases managed at the Mayo Clinic between 1940 - 1999.18 Despite the increased use of RAI during this period, no significant improvement in cause-specific mortality or tumor recurrence were observed in low-risk patients. These findings suggest that RAI should not be given routinely to low-risk patients. Other researchers have suggested basing RAI decision-making in low-risk patients on whether a stimulated Tg is detectable three months postoperatively.19 Vaisman et al. found that of 104 patients, 56.7% had an undetectable stimulated Tg; only 1 of these patients received RAI. If widely applied, less RAI administration may decrease health care spending. In addition to cost, RAI does have potential side effects, including damage to salivary glands, bone marrow, and gonads, especially when given in high and cumulative doses. Therefore, its use should be targeted at patients who are likely benefit from therapy. The third part to standard DTC therapy is thyroid hormone suppression therapy. Because TSH stimulates thyroid growth, the goal of suppression therapy is to keep TSH levels low. The degree of TSH suppression depends on the risk of the cancer, with only high-risk cancers requiring aggressive lowering of TSH. Several series have shown decreased recurrence rates and cancer-related mortality with thyroid hormone suppression therapy in high-risk patients.20 There is no evidence that low risk patients require suppression.13 In fact, the increased risk of atrial fibrillation and bone loss from TSH suppression make aggressive TSH-lowering undesirable in low-risk patients. Because recurrences have been reported sometimes decades from initial treatment,9 patients with thyroid cancer require lifelong monitoring. Surveillance tests include measuring Tg levels while on and off thyroid hormone (or stimulated with rhTSH), neck ultrasounds, and 131I total body scans (TBSs). For patients with detectable Tg and negative TBSs, FDG-PET scanning is commonly employed. Which tests should be done and the time interval between testing must be tailored to the individual recurrence risk of the patient. To date, there have been several Phase II studies evaluating targeted agents in advanced thyroid cancer (Table 1). Most of these agents are tyrosine kinase inhibitors (TKIs) that have activity against pathways that are implicated in DTC. Several agents have multiple targets; some studies include all subtypes of thyroid cancer. Axitinib and motesanib diphosphate are two oral investigational agents with activity against VEGFRs. A Phase II study of axitinib in advanced thyroid cancer enrolled 60 patients (30 PTC, 15 FTC, 12 MTC, 2 ATC, 1 other) who failed standard therapy.23 Documentation of progressive disease was not required. On an intention-to-treat analysis, 30% of patients (7 PTC, 7 FTC, 3 MTC, 1 ATC) had a partial response and 38% of patients had stable disease greater than 16 weeks. A Phase II study of motesanib included 93 patients with progressive DTC with evidence of progression.24 Of 92 patients available for evaluation, 14% had a partial response by RECIST and 35% had durable stable disease for greater than 24 weeks. Common adverse events with VEGFR inhibitors included hypertension, fatigue and diarrhea. Schema of key pathways in the development and progression of thyroid cancer. Targeted agents under clinical evaluation for the treatment of advanced thyroid cancer. 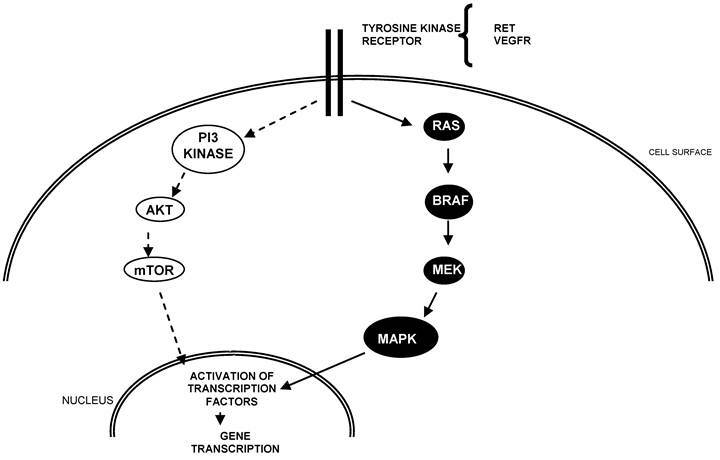 Pazopanib is a TKI targeting several kinases including VEGFR, platelet-derived growth factor, and c-KIT. A Phase II study recruited 39 patients with iodine-refractory DTC with evidence of progression within 6 months of enrollment.25 Confirmed partial responses were recorded in 49% of 37 evaluable patients, the highest response rate yet reported in patients with DTC. The likelihood of response lasting longer than 1 year was calculated at 66%. Common adverse events included fatigue, skin and hair hypopigmentation, diarrhea, and nausea. Sorafenib is an oral TKI with activity against multiple kinases including BRAF, VEGFR and RET. It is currently indicated for the treatment of advanced renal cell carcinoma and unresectable hepatocellular carcinoma. Sorafenib has shown cytostatic effects in thyroid tumor cells lines, both with and without the presence of BRAF mutations.26, 27 Data from several clinical studies of sorafenib for the treatment of advanced thyroid cancer have been reported. One trial evaluated sorafenib in 41 patients with PTC.28 A total of 6 patients (15%) had a partial response. Another 56% of patients had stable disease longer than 6 months. A second study enrolled 55 patients (25 PTC, 19 FTC/HCC, 4 MTC, 5 ATC) with metastatic, iodine-refractory thyroid cancer.29 Median PFS was 84 weeks. Sixteen patients had completed BRAF genotyping. Interesting, patients with PTC tumors harboring BRAFV600E mutations had significantly longer PFS (84+weeks) compared to patients with PTC/FTC wild type BRAF (54 weeks). Preliminary data from a third Phase II study of sorafenib in advanced thyroid cancer have been presented.30 Some 18 patients (10 MTC, 8 DTC) with progressive thyroid cancer were enrolled. Of 10 patients evaluable at 3 months, 9 had stable disease and 1 had a partial response. Sunitinib is an oral TKI with multiple targets including PDGFR, VEGFR, Kit and RET. Sunitinib is currently indicated for the treatment of metastatic renal cell cancer and for imatinib-resistant gastrointestinal stromal tumors. Preliminary results of three Phase II studies of sunitinib in advanced thyroid cancer have been presented. In one study, 43 subjects (37 DTC, 6 MTC) with progressive disease within the previous 6 months who failed standard therapy were enrolled.31 Of 31 patients with DTC who completed 2 cycles, 13% had a partial response and 68% had stable disease. In a second trial, 17 patients with advanced thyroid cancer (8 PTC, 4 MTC, 1 ATC, 4 other) were enrolled. Of 15 patients evaluable at 3 months, 1 had a partial response and 12 patients had stable disease.32 A third trial of sunitinib in advanced thyroid cancer enrolled 18 patients (15 DTC, 3 MTC).33 Although 44% of patients had a radiographic response on FDG-PET scanning, response rates by RECIST have not been reported. Thalidomide is different than the novel agents described above in that it is not a TKI. Although thalidomide was developed as a sedative in the 1950s, it was found to be teratogenic. However, thalidomide was observed to have antiangiogenic properties, although its mechanism of action is uncertain. A Phase II study of thalidomide enrolled 36 patients (13 PTC, 4 FTC, 8 HCC, 4 insular, 7 MTC) with radioiodine-unresponsive progressive disease.35 Of 28 patients available for evaluation, 5 had partial responses and 9 had stable disease. Serious adverse events included infection, pericardial effusion, and pulmonary embolus. More recently, preliminary results from a Phase II study with lenalidomide, a derivative of thalidomide with less toxicity, have been reported.36 A total of 25 patients with iodine-refractory DTC were initiated on 25 mg of oral lenalidomide daily. Of 18 evaluable patients, 22% had a partial response and 44% had stable disease. Targeted therapy presents new therapeutic options for patients with advanced thyroid cancer. However, criteria for ideal candidates for these new therapies continue to evolve. While early trials included patients with measurable but stable disease, most recent studies have focused on patients with progressive disease as these patients suffer higher morbidity and mortality from their cancers and the toxicities of targeted agents are perhaps better justified. Importantly, randomized-controlled studies are now underway to assess whether targeted agents improve survival. Health care costs of newly metastatic thyroid cancer have been investigated. A retrospective longitudinal cohort study using a large (~14 million covered lives) US health-insurance claims database , analyzed the costs of health related interventions in 183 patients with newly metastatic thyroid cancer between 2003 and 2005.40 Inpatient care was the main driver of the total healthcare expenditure, and represented 43% of all costs. Radiation therapy was used in 23%, 131I therapy in 19%, thyroid surgery in 13%, and chemotherapy in 11% of patients. The costs were substantial and totaled $60,196 per patient during the first year and $35,189 during the second year of follow-up. This study did not consider newer targeted agents, which will likely increase costs as well. The appraisal of sorafenib in hepatocellular carcinoma has also been evaluated. The manufacturer (Bayer) submitted evidence to the NICE Committee in which sorafenib compared with best supportive care (BSC) produced a base-case ICER of £64,754 per QALY gained. The NICE Committee, however, issued a preliminary appraisal document with an ICER of £76,067, and stated that sorafenib as a treatment for advanced hepatocellular carcinoma in patients for whom surgical or locoregional therapies had failed or were not suitable, is not cost-effective.42 From the U.S. payer perspective, a recent economic evaluation of sorafenib in unresectable hepatocellular carcinoma versus BSC estimated that the ICER was $62,473 per QALY gained.43 Of note, these studies were performed in malignancies in which the efficacy of sorafenib has been demonstrated in randomized-controlled studies. Nevertheless, these evaluations do illustrate the complex issue of cost and effectiveness with new targeted agents. The addition of targeted drugs has the potential to substantially alter the cost of treatment of advanced thyroid cancer. Thus, as resources are scarce, pharmacoeconomic and quality of life analyses of these different drugs in the US setting will be mandatory. The cost associated with the management of thyroid cancer is bound to increase in coming years. Part of this increase will likely be from costs incurred for the standard treatment of PTC, as this subtype of thyroid cancer has seen a large increase in diagnosis. Controlling cost while still providing optimal care will require better risk stratification in low-risk patients. While certain factors such as increasing age or male gender increase a patient's chance of having progressive disease, current diagnostic tools are inadequate to accurately predict which patients will do well with minimal therapy. While surgery remains necessary for adequate staging, more judicious use of RAI may help control costs. In the future, newer tools, such as molecular genetics to detect more or less aggressive cancers, may aid clinicians in recommending the most appropriate therapy. Although patients with advanced thyroid cancer represent a minority of patients, they require continued evaluation and therapy which will also increase health care expenditures. Although many of these patients receive targeted therapy as part of clinical trials, the availability of sorafenib and sunitinib provides options when trials are not available. These agents do have significant toxicities and costs; therefore, identifying which patients with metastatic disease are likely to benefit novel therapies remains an important research question. At present, results from randomized studies are needed to investigate whether targeted agents improve survival. Whether these agents are cost effective remains an unknown but important question.